Skoda Karoq road test by Steve Rogers | News by Wales Express News, People Before Profit! IF Yeti got Skoda started in the SUV race then Karoq is taking over the baton and is off to a flyer. The Yeti had a name as wacky as the vehicle itself and became a huge favourite because of its quirky looks, versatility and value for money. So should Skoda have given us a Yeti 2? Not really. Things have moved on drastically in the new SUV-crossover world and Karoq is a completely different car. Well, different in as much as it is bigger, has a more mainstream shape and is a lot more sophisticated – overalls versus trendy Chinos and polo shirt. Karoq has been built for this new world and sits on the Volkswagen group’s famed MQB platform, the one that fits uncle Tom Cobbly and all. Golf and Porsche Macan are not bad bed partners so Karoq is in good company. Where does Karoq sit on the crowded SUV merry-go-round? In size it slots into the lower end of the medium compartment so its, Peugeot 3008, Seat Ateca, Nissan Qashqai, Renault Kadjar, Kia Sportage etc. In truth they are all much of a muchness and the one you choose may well be the company offering the best deal. Crucially Karoq offers something different from Ateca, its close relative, and does not have to worry about clashing with VW Tiguan which has grown in size and price. 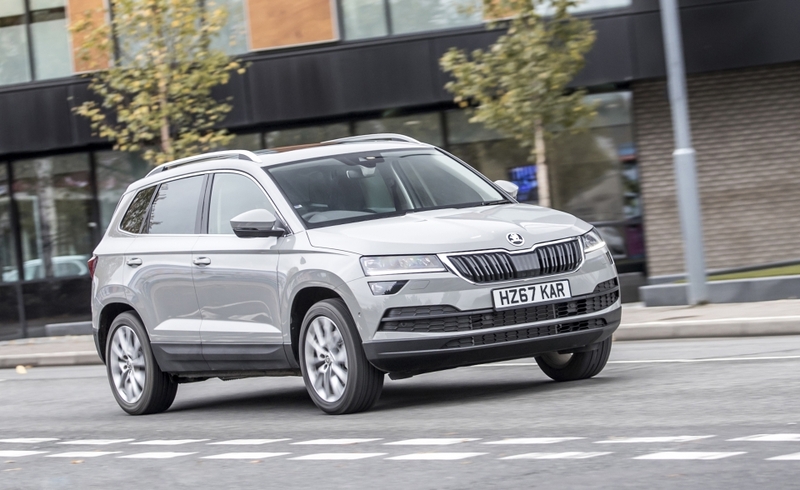 The Skoda has the Volkswagen group’s SUV design DNA running right through it so it is middle of the road attractive rather than a head turner. Inside throws up no major surprises either. Compared to a Peugeot 3008 the layout is deadly plain, the plastics might be good quality but the cabin is bereft of colour – apart from black. Yet the layout is spot on. You don’t have to go searching around, wherever the hand goes will find the right switch. The seven inch touchscreen handles all the major functions apart from the separate heating controls, which is good, and is the focal point that lights up the otherwise bland layout. They call it an infotainment centre now because it houses the radio, navigation, info about the car, Bluetooth and mobile phone paraphernalia. Call it what you will but its performance is exceptional with blurringly fast response times. As for the content of the cabin, well that’s a lot brighter. Yeti was famed for its versatility and Karoq is following in its footsteps. Let’s start with the seats, in particular the three in the back which are individual and slide, recline, and come out altogether although I couldn’t work out how to do it even after the reading the handbook instructions. Skoda prides itself on the Simply Clever promotional tag so Karoq is littered with thoughtful touches. The sealed mini rubbish bin that slots into the door pocket is perfect for discarding sweet papers and such like, then there is the removable torch in the side wall of the boot, a reversible rubber boot cover, pop up shelf on the backs of the front seats along with a variety of handy hooks along the side walls. Karoq offers four wheel drive, something else that sets it apart from Ateca, and as expected drives particularly well doing its best to cushion passengers from the many and numerous road blemishes. I still think Ateca has the best driving dynamics of any SUV in this class but the Skoda will not disappoint and neither will the engine range. My test car was powered by the impressive two litre diesel and was averaging 46mpg according to the long term computer read out and nothing had changed after I had finished my stint. As a caravaner this would be my choice but with diesel power still in the doldrums – May sales figures were down almost 20,000 compared to last year – there are good petrol options, in particular the new 1.5TSI which is an absolute cracker. There is only one minor snag that needs attention. The speedometer has no 30mph digit presumably because the standard calibration is for kilometres. Selecting the digital speedo from the menu in the binnacle means you can use nothing else. A separate readout would solve the problem for UK drivers. 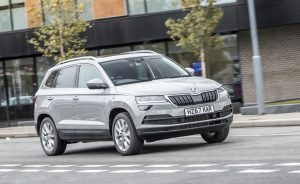 So yet another great car from Skoda and just the job if you are looking for something a bit smaller and cheaper than big brother Kodiaq.